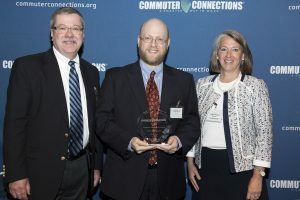 TCG is thrilled to announce that the company is the recipient of the 2017 Commuter Connections Employer Recognition Award for its telework program. The company was recognized at an award ceremony on June 22 at the National Press Club. This is the second time TCG has won this prestigious award. TCG’s telework program has resulted in 831,300 vehicle miles conserved in 2016 and 42,000 gallons of conserved fuel. This represents a 240% increase since TCG first received a Commuter Connections award in 2010. TCG was similarly recognized by the District Department of Transportation in 2017 for its telework program. TCG has a telework-first model where management prefer and advocate for employees to work remotely. This has resulted in over 50% of staff teleworking five days per week, and almost 80% of staff teleworking at least one day per week. Some TCGers have compressed work weeks and alternative work schedules that complement teleworking. TCGers who do travel for work may take advantage of TCG’s commuter benefits which include Metro’s SmartBenefits, Capital Bikeshare, and reimbursement for bicycle and walking (shoe) expenses. The telework program, along with other benefits to working at TCG, have contributed to high rates of job satisfaction. TCG has been the recipient of a Washington Post Top Workplace award for the past three years. In 2016, TCG was Great Places to Work(™) certified, and was listed No. 3 Best Medium Workplace and No. 4 Best Place to Work in Tech by Fortune. TCG (http://www.tcg.com) delivers the positively distinct IT and management advisory services that propel America forward. We help government agencies achieve the amazing, saving taxpayers more than $1 billion. Commuter Connections is a program of the National Capital Region Transportation Planning Board at the Metropolitan Washington Council of Governments, www.mwcog.org. Commuter Connections promotes bicycling, transit, ridesharing, and other alternatives to drive-alone commuting, provides ridematching for carpools and vanpools, and offers the free Guaranteed Ride Home program. Commuter Connections, www.commuterconnections.org is funded by the District of Columbia, Maryland, Virginia, and U.S. Departments of Transportation.